I know we are getting close to the beginning of fall, but ice cream is always a good idea. 🙂 This Apple Pie Ice Cream is so awesome! It seriously tastes like an apple pie ala mode. 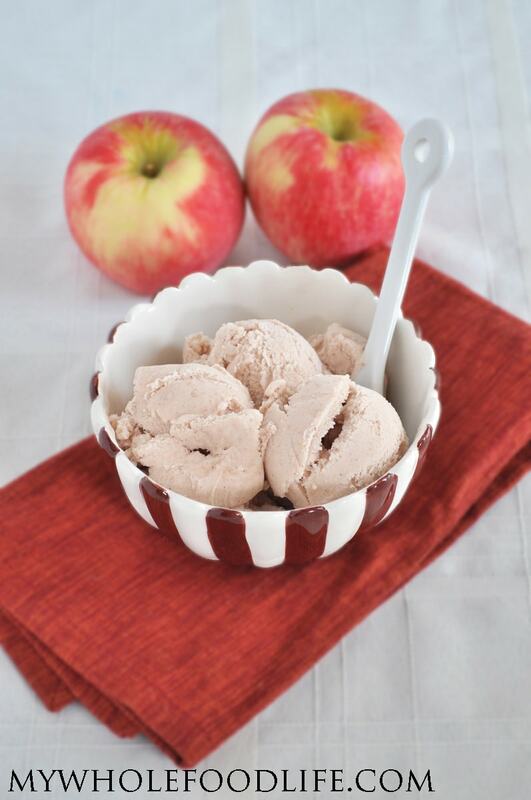 The best thing about this apple pie ice cream? It’s made healthier! I was licking the spoon as it was churning in the ice cream maker. This might just be my most favorite ice cream recipe ever. I used my crock pot applesauce for this recipe. I highly recommend doing the same. Slow cooking the apples in all the spices brings out the natural sugars and creates a great flavor profile for this recipe. I think that is what brought this over the top for me. The BEST apple pie ice cream ever! Transfer to an ice cream maker and turn on. It took about 15-20 minutes to make ice cream in my Cuisinart. If you choose to make this using regular applesauce, you will need to add the spices to it. I suggest 1 1/2 tsp cinnamon, 1/4 tsp nutmeg and 1/4 tsp ginger. For optimal results, make this recipe using the crock pot applesauce. This ice cream will have a soft serve consistency. If you like a harder ice cream, place it in the freezer for 1-2 hours. Enjoy! I like to store my ice cream in these tubs . What a great formula for healthy ice cream. And one that tastes like Apple Pie? COUNT ME IN! Thanks for sharing! Thanks so much! Very excited to try this! If I want to make the crock pot applesauce but dont have a crockpot, how do you suggest I make it? Cook it in the oven for a long time? On the stove? You can cook it on the stove the exact same way. Just cook on med-high. It's never too cold for ice cream in my book!! This looks delicious. Thanks for directing us to your applesauce recipe, too. I love this time of year with all these comforting fall flavors. Please keep the great recipes coming!! You're welcome Kayla! I hope you enjoy both those recipes. My kids love the applesauce! Can I substitute milk for the coconut milk? If so, do you know the amount that would work? Yes. I would suggest using whole milk to keep the consistency creamy. Use about 2 cups. Did you use a particular apple? Thanks Melissa. I used honey crisp, but any apple will do. I also like using galas. Thank you Melissa.....will be making this soon. DH loves apple pie, should be a great treat for us. It's in the I cream maker right now! I've also licked the bowl clean. Yummy!! Yay!! I hope you love it as much as I do. Oh never tried apple pie ice cream before - I need to get me ice cream maker!!! Love my ice cream maker! Just wondering which ice cream maker you use? I've never owned one but would love to get one and try your ice cream recipe! You are so welcome Kristy! I don't have an icecream maker- any other suggestions to make it into icecream? You can blend and pour into ice cube trays. Then blend again once frozen? Thank you! You can probably blend, then freeze in ice cube trays. Then re-blend once frozen again? That could work. The Cuisinart Ice Cream maker's bowl is made from aluminum which is not healthy. Is there an ice cream maker that has a stainless steel bowl (inside)? I don't think they make a stainless steel one yet. I am not worried about the Cuisinart because I am not heating it up.